Detroit Red Wings, Life, Social Media and anything intriguing! Everyone in life needs a mentor. The path in which they come in and out of our lives is a journey that can be short or long. 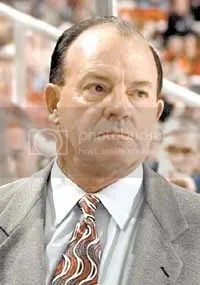 Scotty Bowman was with the Red Wings since 1993 and he has always been in the shadows to help every coach after him if they needed some guidance. Every year until this year when he decided to leave for Chicago. His Son, Stan that is an Assistant GM, is documented for having cancer, so he went to be with his family and to help grow the franchise that has a long suffering tradition. Scotty was a Coach and Mentor for the Detroit Red Wings since 1993! With the training wheels off it seems like the Red Wings have lost their drive and lack the urgency to get things done and they are NOT acting like the team that had won the Cup last year. Some say that it is the well documented Cup Hangover that most Cup winning teams suffer. Which I do agree could partly true but I also think the Bowman factor could be another factor that is not well documented. They also are not acting like a TEAM. Where did the TEAM go? That is a mystery that we are waiting to find out. When you have a well established coach that has been with the team in some for since 1993. Some of the members of the team were coached by him, and Coach Mike Babcock, used to have talks with him everyday or almost everyday and then he is gone. You lack the person from the other side that sees the ice and how you document things differently then from someone that is inside the organization. I think these slow starts might be a combination of two things. Todd McLellan leaving and Scotty Bowman not being in the shadow. When the training wheels get taken off and you have to go solo that has to have some kind of trickle down effect on the team that has been used to him being in the shadows for so long. What do you do when your mentor decides that it is time to take a different path? Do you have the confidence to pull things out or do you change your way of thinking? These things can be applied to life and NOT just the Red Wings.